Wayne Gustaveson has shared this photo of Sharon Hunt who completed her week-long fishing trip to Lake Powell after catching a mixed bag of striped bass, walleye, largemouth and smallmouth bass. Her expression makes a good point: Now’s a great time to go fishing — and to cool off in the process at one of the Southwest’s northern lakes. Even right at home, the Community Fishing Program offers some great fun for the kids and their families. 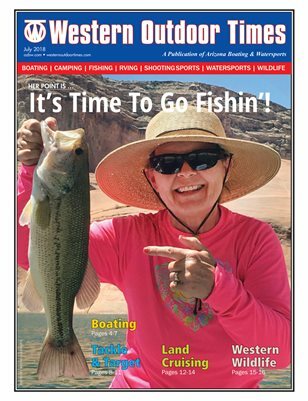 In our “Tackle & Target” section of this issue, reel-in more angling news such as Margie Anderson’s “Arizona Lakes:Arizona Pros” article that features Lawrence Dwonch, the possible record-setting monster Gila trout catch, and for salt-water anglers, a note about The Modern Fish Act. It’s summer. It’s hot. However, it is also an excellent time to cast your lines for some seasonal fun and relaxation. Enjoy!